"Published October 2007. Reviewed February 2011." 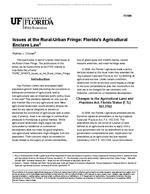 Issues at the Rural-Urban Fringe: Florida's Agricultural Enclave Law 4 industrial, commercial, or residential property does not result in economically efficient agricultural production or compatible neighbors. Debates on land use allocation, private property rights, sprawl, etc. will continue in the future as long as the state's population continues to grow. Florida Department of Community Affairs. 2006. The Future Land Use Element. Rule 9J-5.006, Florida Administrative Code. https://www.flrules.org/gateway/ RuleNo.asp?id=9J-5.006. State of Florida. 2006. Agricultural Lands and Practices Act. Florida Statutes, Chapter 163.3162. http://www.flsenate.gov/Statutes/ index.cfm?App_mode=Display_Statute&Search_ String=&URL=Ch0163/SEC3162.HTM&Title=>2006->Ch0163->Section%203162#0163.3162. State of Florida. 2006. Agricultural Lands Classification and Assessment Act. Florida Statutes, Chapter 193.461. http://www.leg.state.fl.us/Statutes/ index.cfm?App_mode=Display_Statute&Search_ String=&URL=Ch0193/SEC461.HTM&Title=>2007->Ch0193->Section%20461#0193.461n.